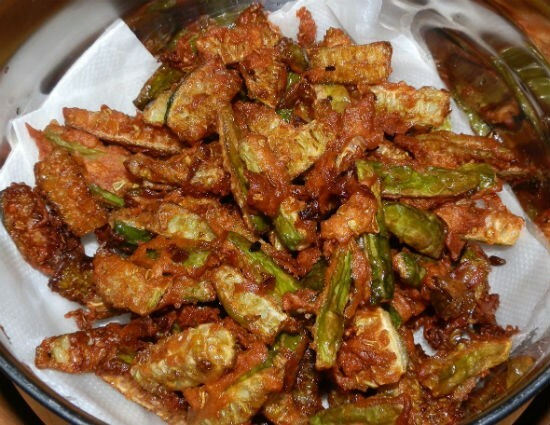 Kovakkai is a popular vegetable in South India. This Kovakkai Varuval recipe is easy to make and is best served with rice items, especially curd rice or with chapatis. 1. Dry roast the bengal gram for 45 seconds or until golden. 2. Remove and grind together with coconut, cumin seeds and curry leaves to a fine powder. 4. Fry the mustard seeds for 30 seconds. 5. Add curry leaves, onions, tomatoes and kovakkais. 7. Add sambar powder and salt. 9. Sprinkle some water and cover the pan with a lid. 10. Remove the lid when all moisture has evaporated and kovakkais are crisp and cooked. 11. Sprinkle the ground powder and stir once. 12. Remove and serve as side dish. Feel free to comment or share your thoughts on this Kovakkai Varuval Recipe from Awesome Cuisine.